If you take the health of your home, business, or business, and it’s occupants seriously, then you likely perform regular maintenance on certain aspects. Preventative maintenance is the best way to improve the longevity of household and industrial equipment while ensuring that they continue to run efficiently. After all, if your HVAC unit isn’t regularly cleaned and maintained, it’s going to wind up losing efficiency. This means that you’re going to be paying more for your utility bills as a result, and this is a irresponsible way to lose hard-earned money every month. Having regular maintenance performed on certain parts of your home, condo, commercial building or industrial building can keep everyone safe inside of the building, keep the building itself safe, and save you money in the long run. One of those preventative measures that you can have utilized regularly is air duct inspection services to determine if your home requires residential duct cleaning, and if your building requires commercial duct cleaning. One of the most important aspects that an air duct inspection can do is to check for mold inside of your air ducts. Since the growth of mold can negatively impact the health of anyone inside of the building, it’s important that it is removed as quickly as possible. An inspection can inform you if you need to have mold removed from the ducts. It can also tell you just how extensive the mold growth has become. This can help you improve certain areas of your home and business to limit the amount of moisture that is leaked into the ducts. Whether through wear and tear or accident, it is possible for air ducts to become damaged. It’s just also pretty difficult to tell if they’re damaged unless it’s blatant. 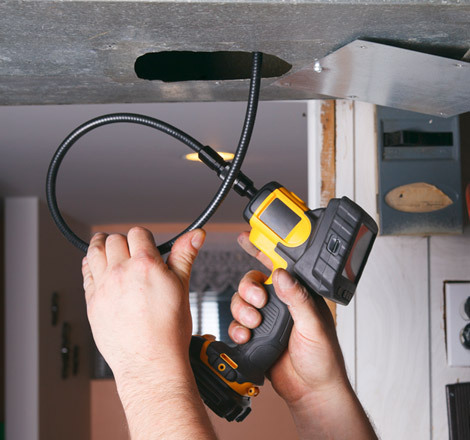 An inspection conducted by a professional air duct cleaning company can check through the large expanse of the duct to look for any damage that it might have received. Since a damaged air duct doesn’t allow cool or warm air to flow as efficiently throughout the home as an unbroken air duct, it’s vital for the efficiency of your unit to ensure that every nook and cranny of your duct is in good shape. It may be unpleasant to think about but it is possible for animals to access your ducts. When it becomes chillier outside, animals usually try to find ways into the air ducts because they’re a lot warmer. In so doing, they can leave animal waste behind, food waste, and they may even end up dying within the duct. This can leave a terrible odor behind. No matter whether you run a business or own a home, no one wants the smell of a dead animal reeking up their building. An inspection can locate the animal, remove it, and also check to see if there was any other waste left behind as well as any damage taken.